"I don't get great gratification, as old as I am, that I need to coach somebody. After Abdi Bile, who I think was probably the greatest athlete I will ever coach, I didn't really need to be stroked. Some people will do it for nothing and they'll do it for whatever. I'm not going to do it for nothing. I'm also gonna do it my way, and I know you could say '(or) the highway,' but it's not really that strict. But I'm just not into self-gratification that I have to coach somebody that's great." - Coach John Cook talking to LRC co-founder Robert Johnson about Shalane Flanagan and Erin Donohue leaving his training group last year. Rudisha vs. Kaki - Who Breaks 800 WR First? Haven't been to the dentist in 10 years. What should I expect when I get my teeth cleaned next Monday? LRC Boards: 4 Sub-4:00s In Armory The deluge of Americans breaking 4 continues in 2010, as Columbia's Kyle Merber became the 2nd Ivy Leaguer ever to run sub-4 indoors with the win and all-time Ivy indoor best, while LetsRun favorite, Maine's Riley Masters, went sub-4 again. It's pretty much a certainty now that sub-4 NCAA milers will not make the NCAA indoor meet. 20 NCAA runners are currently sub-4 this season. At least 12 were on oversize tracks. *Notre Dame Alex Wilson Invite Results 9:37 gets 10th in DMR, Chris Barnicle runs best race of his career, winning the 5,000 by 7 seconds in 13:47. 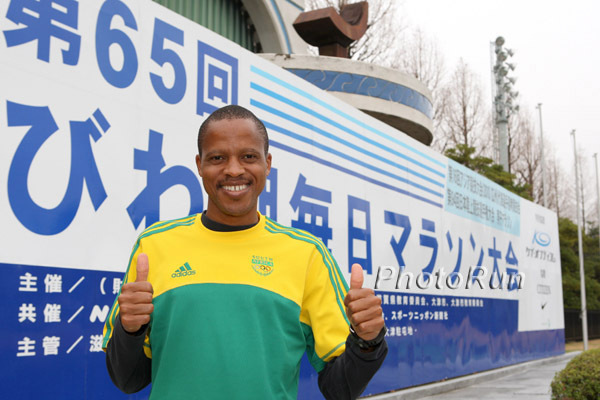 Japan's Oldest Marathon - Lake Biwa Marathon - Features Ramaala, Tsegay, Munyeki And Top Japanese South African marathoning icon Hendrick Ramaala will race this Sunday's Lake Biwa Mainichi Marathon, Japan's oldest marathon. He will compete against 2008 Olympic 4th-placer Yemane Tsegay of Ethiopia, some solid Kenyans and 5 Japanese runners with PRs between 2:08:40 and 2:10:59. 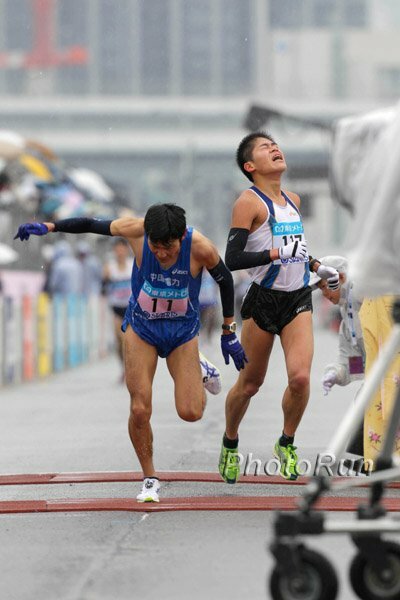 *New LRC Content Photos From Bad Weather Tokyo Intl Marathon Despite terrible conditions, the toughest marathoners on the planet (that would be the Japanese) had 6 under 2:13:16. Thanks to PhotoRun.net for the photos. *LRC Robert Johnson Talks Tokyo Marathon In LRC Week That Was Only 7 Americans ran 2:13:16 or better in 2009. 6 Japanese marathoners did it in tsumani conditions in Japan this weekend. Breaking News: Letsrun.com Has Learned How To Use iTunes There was champagne flowing in LRC headquarters this afternoon as we listened to Rojo interview John Cook on iTunes and our iPod. Darwin Awards Candidate: British Hurdler Caught Taking Clenbuterol If you're dumb enough in this day and age to take a steroid like clenbuterol while being a citizen of a country that actually tests for drugs (aka not Russia), a 2-year suspension really should just be a lifetime ban. LRC Favorite Ezekiel Kemboi Will Retire From Steeple This Fall and Go For The Marathon He says he's going for the steeple world record first. Bravo if he gets it because Shaheen's 7:53.63 is no joke. *Reminded Us Of This: LetsRun.com Video of Kemboi After Winning Gold In Berlin Kemboi was the guy who shaved the Nike symbol on his head. Wow... "I'm not into running an American record in front of 30 people and a bunch of trees." I think this is what America's distance running problem is: the most talented athletes are always injured. Why is that?